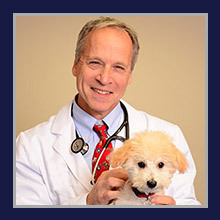 Dr. Gary Selmonsky, the proprietor of Wantagh Animal Hospital, has been an important addition to the South Shore community since his arrival in February 1988. Born and raised on Long Island, Wantagh was a natural fit. Although at first contemplated continuing as an Equine veterinarian at Belmont Racetrack, where he assisted for 5 years, he returned to his great love of small animal medicine. Wantagh Animal Hospital, with Dr. Selmonsky's direction, has expanded in size twice. The hospital now offers state of the art digital radiology, ultrasound, and countless other improvements. Dr. Selmonsky would like to thank the local community for all of their support over the years. He is honored to care for our very important companions. When not caring for your pets, Dr. Selmonsky and his wife Rosio enjoy skiing, scuba diving, art museums, theatre, their two Italian greyhounds (Sophia and Marchello) and their Yorkie (Millie).